After the war was lost, Ferraro persevered with another war, until the final defeat in 1945. In this war, he didn't kill anyone, never fired against other Italians. On the contrary, in agreement with the partisans who, in theory, were his enemies, he saved men and important industrial estates from the Nazi retaliation. The “Gamma” Group “Licio Visintini”, of which Ferraro was part, did not dissolve on September 8th 1943. Instead, it was fully handed over to the R.S.I. From November 1943, he was in Valdagno (Vicenza). In January 1945, the "Gamma Group" was split into various Squads, which would have had to act behind enemy lines to carry out sabotage as the front line advanced. In April 1945, some of these Squads were already stationed in the areas where they were scheduled to operate. The Command stayed in Valdagno with Ferraro and about forty men. The Commanding Officer Wolk was given another assignment and was transferred to Venice. "On April 26th, the Council Secretary and two representatives of the C.L.N. came here and said: "The authority passed from the Social Republic over to the C.L.N., we need your help [ ... ] there is a German column that wants to blow up the bridge and the premises". I answered that I was and remained the highest military authority in the country. Therefore, in order to save the bridge and the Marzotto premises, I would have to intervene in person by leading the German column out of Valdagno, without causing any difficulty to the partisans. I went to negotiate. 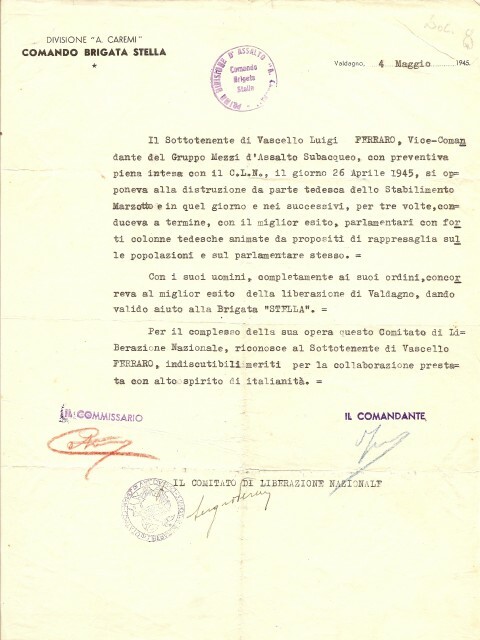 The column wanted to pass through Valdagno and I needed some guarantees on the part of the C.L.N in order to make an agreement with the Germans. Dressed as the "X Mas" Commander, on the day following the liberation I went into the village. I was looking for valid partisan leaders, but each one of them claimed to be a leader. Finally, I found two guys in the centre of Valdagno, whom I felt I could rely upon more. Same discussions, same promises. Then, when I returned to the column's Commander, a German captain, and after I gave him the assurances I received, he said: "You have to follow me". I was on my motorbike. The Captain, pointing his gun at me, followed me together with the column. Everything went smoothly and we went through Valdagno without any problems. Outside the village, I said goodbye and came back. This episode lasted around fifteen days. On one occasion, a German column, instead of stopping near Valdagno, decided to stop at Cernedo, 5 kilometers before the town. An official arrived with an interpreter from Trieste, saying that they intended to take a number of hostages. The discussion lasted for many hours. In the afternoon, a crackle of firearms came from the undergrowth. There was great alarm among the Germans. A marshal pointed a machine-gun at my chest, I snatched it away from him and started shouting curses at him and at everyone else. An officer rushed towards us, a Major, who, in a low tone, told me he was prepared to believe me and to accept my suggestions. "Head to Vicenza and go through the Schio valley". They all followed me, the Major with the entire column. I led the way as usual, on my motorbike. Then we said goodbye. At the last moment, the Major said: "You should stop here, we have to go [ ... ] give me your motorbike, we need it more than you do". I gave him the motorbike, then I realised that I was 5 kilometres away from Valdagno and I was alone with a sailor. In Valdagno I was protected by the C.L.N., but there I definitely wasn't. So we went in the river and made our way back that way. In the meanwhile, on a daily basis, I was discharging the sailors of the Group one by one, with safe conduct by the "Stella" Brigade. Eventually I was left alone with some non-commissioned officers. One day, to prevent the Germans from passing through, the partisans told me they intended to blow up the bridge, but I objected. It would have been a terrible mistake. "I will mine it myself" I told them "But I'll only blow it up if I'm forced to". I went there with my non-commissioned officers and I mined the bridge, standing by to detonate the explosive. "If the Germans execute me, go ahead with the blast, otherwise everything should stay as it is" I ordered the C.L.N. The Germans crossed over again and the bridge was saved. On one particular day, during the second half of the month of May, something changed in their attitude towards me. The Command of the "Stella" brigade, informed me that they decided to transfer me to Valdagno di Sopra, where a dangerous mob was based. "No chance" I answered. "I have nothing in common with them. You approached me, asked me to cooperate and so I did. If that's how things stand, I'll go back to the barracks". Then another change in attitude. They started talking of safe conduct: it had to be the only logical solution. "I sent all the Navy material to La Spezia, where it was delivered on a regular basis." As per the rest of the material, I sent it to the Municipal Administration. After gradually discharging all the personnel, I was left completely alone. At the end of May, when everything came to an end, we embraced and said goodbye and I headed to Bergamo where my family lived. Once all the men were back home, I started hearing that some of them were arrested here and there. So I went to Venice to the allied Command to protest, and the Command sent dispatches to all police departments, so that those arrested were released immediately". On May 27, Lieutenant Commander Lionel Crabb, a famous Royal Navy "frogman" and Major Antony Marzullo from the U.S. Navy, arrived in Valdagno and offered Ferraro cooperation with the allied navy forces in the war against Japan. Ferraro thanked them for the proposal but refused.